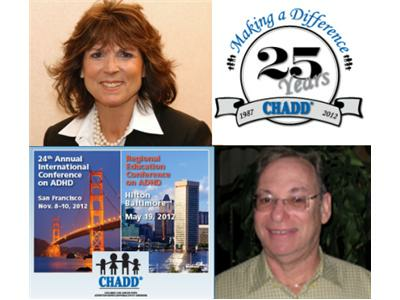 Children and Adults with Attention Deficit Hyperactivity Disorder (CHADD) will be celebrating “25 Years of Making a Difference” at its annual conference in San Francisco from November 8th through the 10th. In this episode of Attention Talk Radio, co-hosts Jeff Copper and Kirsten Milliken interview conference chair Anne Teeter Ellison EdD and Harvey Parker PhD about the conference. Listen to this show to hear Dr. Parker recount briefly 25 years of advancements made in ADHD, along with brief interviews with featured speakers Russell Barkley PhD, Stephen Hinshaw PhD, Linda Pfiffner PhD, and Martha Denckla MD who will give us a preview of their presentations. At the end of the show we’ll talk about the gala celebration that will take place Friday, November 9, in celebrating 25 years of making a difference. If you have an interest in ADHD, you don’t want to miss this show!